The sales division for Rendering, has won an order for the delivery of a new unit of cooker. In this case the final destination will be Russia and the supply will be supplemented with additional equipment for pressing and filtering the processed meat. The most remarkable fact is that this new unit represents the cooker nº 100 since Bigas Alsina, SA started the development and manufacture of this equipment in the early seventies. Since then there have been many changes that have been added to its design, in many cases adapted to the specificities required by different customers. Although it was originally designed for the treatment of non-edible meat by-products, its capacity as drier andpressure vessel has served its purpose to expand to other duties. 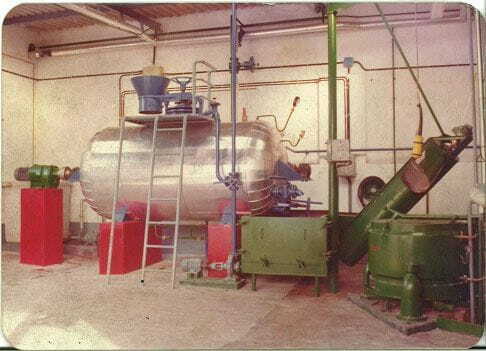 Thus, for example, there are digesters adapted to straw sterilization, drying of sewage or waste sterilizer / pasteurizer in facilities for biogas production, to name a few. The new unit will be delivered to its new owner in June 2014 and it's expected to be operational by the end of August. In the picture above, one of the first unids made.